4Videosoft DVD to Creative Zen converter for Mac is professional and fully compatible with Mac OS X, supports Leopard and Tiger, which work well with either Power PC or Intel processors. 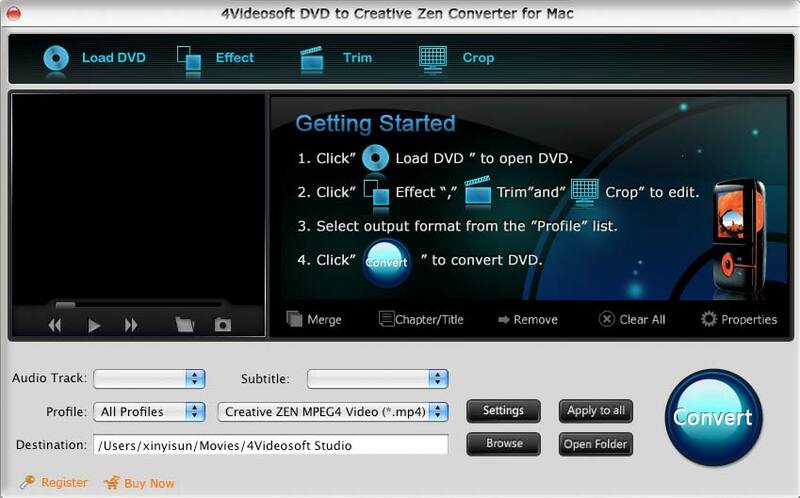 DVD to Creative Zen for Mac supports formats including AVI, MP4, MPG, etc regular video formats and MP3, M4A, WMA, WAV audio formats for most Creative Zen multimedia players. You can get the right video and audio format compatible with Creative Zen for playback. You are available to adjust the video effect like Brightness, Contrast, Saturation and check Deinterlacing to eliminate some jaggedness from the interlacing video to improve your video quality. Qweas is providing links to 4Videosoft Mac DVD CreativeZen Converter 3.1.06 as a courtesy, and makes no representations regarding 4Videosoft Mac DVD CreativeZen Converter or any other applications or any information related thereto. Any questions, complaints or claims regarding this application 4Videosoft Mac DVD CreativeZen Converter 3.1.06 must be directed to the appropriate software vendor. You may click the publisher link of 4Videosoft Mac DVD CreativeZen Converter on the top of this page to get more details about the vendor.